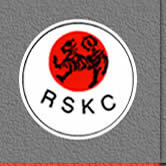 Sensei R.A.Bertie will hold the second grading for the year at Rochfords Dojo on Sunday 29th July from 10.00 am to 11.30 am. Please make sure your Licence is up to date, your record and grading book has been signed, and passport photo inserted on the correct page. 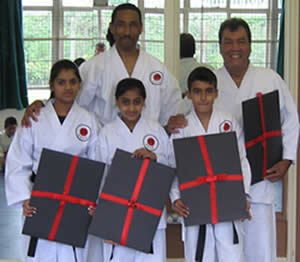 The Second Black belt grading for 2007 will be held at Rochfords on Sunday 29thApril from 11.30 am to 12.30 am. Sensei R.A.Bertie will take the grading. I hope all first Kyu's will use this time to get them selves in shape for the grading date. Above Students Sukhpreet Talewar Gagandeep Talewar Jovan Bhandal and Vib Verma before and after the Dan grading. Richard became the youngest Dan grade at eleven years of age which seems quite an achievement and it was until Piers (pictured above with the Afro hair do) came and took that title away from him in and achieved the same result at the tender age of eight. As records go Vib pictured above (second row far right photo on left of page) has set another first at the club, Vib himself has become the oldest Dan grade and along with his two Sons Rishi and Rohan another Record was set of being the most students from one family to hold dan grades at the Club. Well done and congratulations to all the above.